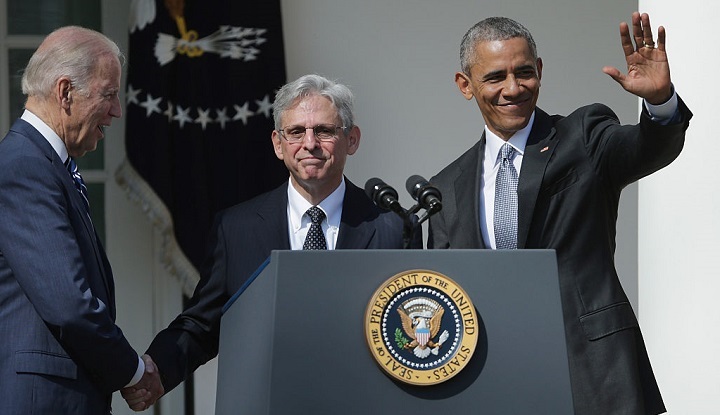 President Barack Obama and Vice President Joe Biden stand with Judge Merrick Garland, Obama’s pick to replace Antonin Scalia on the Supreme Court, at the White House in March of 2016. A dark money organization that spent $7 million to block former President Obama’s Supreme Court pick received just three donations between 2015 and 2016, but one transaction really counted: A single $17.9 million contribution from a mystery donor. The Judicial Crisis Network (JCN), a Washington, D.C.-based conservative nonprofit, saw its revenues explode as it ran ads thanking Republican senators who successfully prevented Merrick Garland, Obama’s pick to replace Antonin Scalia, from receiving a confirmation hearing. It also sent millions of dollars to nonprofits that worked to elect conservative state judicial candidates and attorneys general. Earlier this year, JCN spent $10 million on ads to help secure Supreme Court Justice Neil Gorsuch’s confirmation. 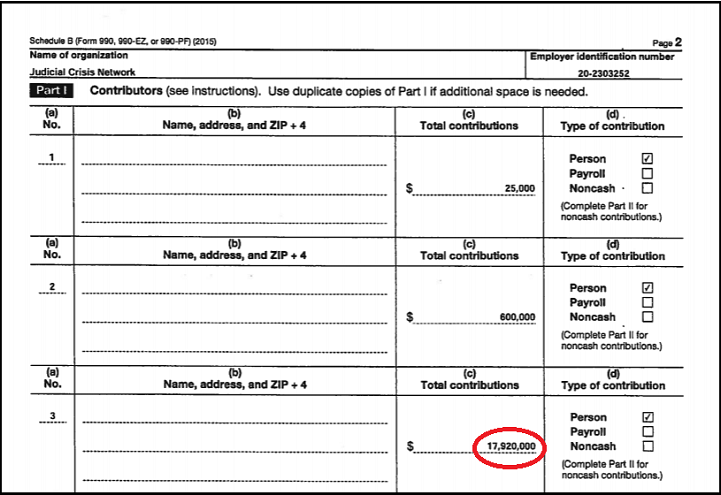 The organization’s most recent tax return, covering July 2015 to June 2016, shows JCN’s anti-Garland spending spree was fueled by three contributions. The $17.9 million donation accounted for 96.6 percent of its revenue. Before the donation, the organization had never reported more than $6 million in revenue since its 2005 creation. anonymous contribution for $17.9 million. Because it is a nonprofit, JCN isn’t required to publicly disclose its donors, and the organization declined to answer questions about the source of its massive cash infusion. But in the past, much of its funding has come from the Wellspring Committee, a secretive Virginia-based dark money organization. Wellspring reported giving JCN more than $15 million between 2012 and 2015; it was one of only two contributors to JCN between July 2014 and June 2015. The organizations have personal ties. Wellspring is run by Ann Corkery, a Washington lawyer who is married to JCN’s longtime treasurer, Neil Corkery. Daniel Casey, a director for JCN, is the father of Wellspring director Michael Casey. The two organizations use the same street address — a Washington, D.C., United Parcel Services office — in their corporate filings. Wellspring, also a nonprofit, doesn’t disclose its donors, and no other organizations have reported giving to the group since 2011. Wellspring’s 2016 tax return, which will show its donations to other nonprofits, is not due until early November. While JCN received widespread attention for its spending on the Supreme Court nominations, the organization also has spent substantial amounts of money on conservative state initiatives. The network donated $1.4 million to the Wisconsin Alliance for Reform, a dark money organization that spent $1.5 million to re-elect Wisconsin Supreme Court Justice Rebecca Bradley. The justice, who once described former President Bill Clinton as a “tree-hugging, baby-killing, pot-smoking, flag-burning, queer-loving, bull-spouting, ‘60s radical socialist adulterer,” was appointed to the court in 2015 by Gov. Scott Walker. In the race for chief justice of the Arkansas Supreme Court, JCN ran more than $600,000 worth of ads attacking Courtney Goodson, an associate justice. The network also contributed $300,000 to a Nebraska campaign attempting to stop the state from repealing the death penalty, and it gave $200,000 to the North Carolina Chamber of Commerce. The North Carolina donation was used to support conservative Robert Edmunds in a state supreme court race. The organization provided substantial support to other dark money groups dedicated to helping Republican candidates. It gave $1.2 million to the Republican Attorneys General Association, which elects GOP attorneys general, and $350,000 to its nonprofit affiliate, the Rule of Law Defense Fund, which helps organize state challenges to federal regulations and which was led by Oklahoma Attorney General Scott Pruitt before he stepped down to take over the Environmental Protection Agency in the Trump administration. JCN also gave $500,000 to the Republican Governor’s Association, which supports Republican gubernatorial candidates, and $325,000 to the Republican State Leadership Committee, which was the biggest outside spender in 2016 state judicial races, according to the Brennan Center for Justice.